Hatters boss Nathan Jones hopes that the news 2020 Developments (Luton) Ltd have agreed terms with British Land PLC to buy the derelict site at Power Court moves a new stadium one step closer for the club. 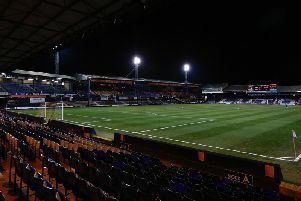 Contracts have been exchanged between the two parties and are expected to be finalised next week, with Luton having submitted a planning application to build a 17,500 stadium in its place. It’s a great project and we really, really want to take the area, the club and the people of Bedfordshire forward. When asked for his thoughts, Jones said: “We’ve said on numerous occasions that this is an exciting time for the football club, but probably more importantly, the area. “We’re delighted with how things are progressing off the pitch. It’s a great thing for Luton, it’s a great thing for Bedford, it’s a great thing for north of London, anywhere in and around that. “Any good news towards that is vital really for the area. We hope that people keep getting behind it. We hope that people see sense and that it’s not just something that we’re doing as we mentioned gratuitously. Meanwhile, speaking to the club’s official website, chief executive Gary Sweet added: “I am so pleased to be able to confirm this key deal for the Football club and the town as a whole. It is a milestone achievement in the history of both. “We have held positive discussions with British Land for a long time now and our relationship has always been productive, fair and always professional. “I’d like to thank British Land and all parties involved for their co-operation and their belief in our vision for Luton. We see this as vital for the regeneration of an historic part of Luton town centre.